the use of principles of dialysis for removal of certain elements from the blood while it is being circulated outside the body in a hemodialyzer or through the peritoneal cavity (see peritoneal dialysis). The procedure is used to remove toxic wastes from the blood of a patient with acute or chronic renal failure. Called also dialysis, kidney dialysis, and renal dialysis. adj., adj hemodialyt´ic. Either the membrane lining the peritoneal cavity (in peritoneal dialysis) or a synthetic membrane (in extracorporeal hemodialysis) may be used as the dialyzing membrane. In the latter, the patient's blood is pumped from the arterial circulation through the hemodialyzer to the venous circulation. 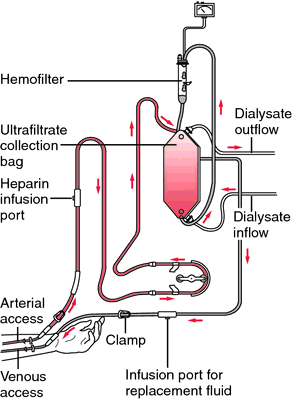 In the dialyzer, it flows past a cellulosic or synthetic semipermeable membrane while dialysate fluid flows past the other side of the membrane. Small molecules and ions diffuse through the membrane, passing from the side on which the concentration is higher to the side on which it is lower. The dialysate fluid contains no urea or creatinine, so that these constituents are removed at maximum rates. The concentrations of electrolytes are adjusted according to the needs of the patient. If the patient has hyperkalemia or hypernatremia, the excess ions of potassium or sodium are also removed. Other electrolytes are adjusted so that serum pH and electrolyte levels are not changed by the dialysis. Large molecules and blood cells cannot pass through the membrane and, therefore, stay in the blood. Two commonly used accesses to the patient's vascular system are the external shunt and the internal arteriovenous (AV) fistula. An external shunt is usually indicated when dialysis must begin immediately. It requires two lengths of specially prepared tubing; one for insertion in a vein and the other in an artery, usually in the forearm. Between dialysis treatments, the tubes are joined by a connector. Although the external shunt has the advantage of being immediately available for use in an emergency, it has the potential of becoming infected or obstructed with clots, and, if the integrity of the system is disrupted, rapid and copious blood loss may occur. The internal AV fistula is surgically created by anastomosing an artery to a vein; that is, the vein is arterialized or made into a large superficial vessel that is easily accessible by venipuncture. The fistula must heal gradually and become mature before a cannula can be inserted. When end-stage renal disease is inevitable, the fistula can be prepared months in advance for use when symptoms of uremia appear. Patient Care. Hemodialysis treatments for chronic renal failure are usually done two to three times a week. The problems that a patient on hemodialysis may experience are fluid overload (hypervolemia), electrolyte imbalance, and alterations in blood components, leading to anemia or platelet abnormalities resulting in a tendency to bleed excessively. Another problem is infection, either of the access site and the blood or in the urinary or respiratory tract because of urinary or pulmonary stasis. Infection with human immunodeficiency virus is also a possibility since blood has not always been routinely screened for this virus and clients may have been infected. Precautions must be taken when handling any blood products or the dialysis equipment. Patients who depend on hemodialysis to prolong their lives require extensive instruction in the care of their cannulae and access sites. Some individuals receive intensive training and are able to undergo hemodialysis at home. A partner must be trained in order to safely administer home hemodialysis. Follow up care, instruction, and evaluation by health care professionals are imperative to ensure patient safety. Patients also must know about special precautions for avoiding the complications that accompany long-term hemodialysis. The purposes for prescribed medications should be explained, as well as side effects that should be reported. These drugs may include multivitamins, antacids, iron supplements, antihypertensives, digitalis, vasodilators, and antibiotics. Rigid dietary and fluid intake restrictions are particularly difficult for some patients and their families. Patient compliance can be a major challenge to caregivers who also must work with family members to help them deal with changes in sexual activities, role reversal, financial burdens, and encouragement of self-care and independence for the patient, balanced with as much support as necessary. Additionally, caregivers should take time to examine their personal feelings and clarify their values in regard to patients' rights to treatment or refusal of it, and allowing patients to die with dignity. Heparin is given before treatment is begun to patients who are to be treated by extracorporeal hemodialysis in order to prevent clotting of the blood during the procedure. 1 abbreviation for hepatitis D.